NOTE: Some images show a roof on a previous model. For payment options, such as Electronic Fund Tranfer, Cheque or Cash payments, please contact Rex Bentley via email rex@micaddy.com.au or phone: (08) 6262 5293 Mobile: 0418 833 329.
with Canopy and drop down screen. without Canopy and drop down screen. 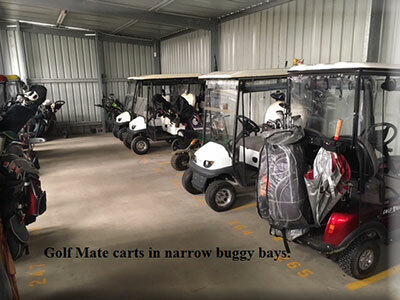 Our final Quality Control undertaken in our workshop ensures that all Golf-Mate carts are built to Australian standards and are backed by the excellent warranty and after sales service that MiCaddy has earnt a reputation for over the past decade. 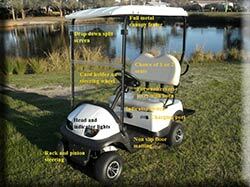 The Golf-Mate electric golf carts can be used as either a 1 or 2 seat cart as required. 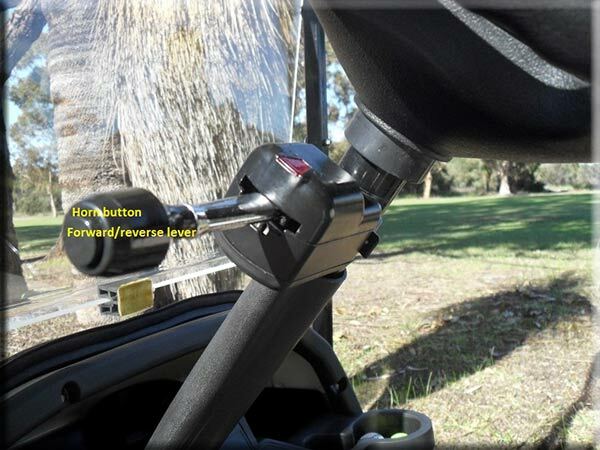 A quick release single bag holder is available for those that do not want to share the cart with another golfer but wish to enjoy the freedom of a double seat cart. At $5,450 they are around half the price of the larger traditional carts seen on many courses. As a customer once said "3/4 the size at around 1/2 the price". Beside being very affordable by comparrison there are major savings such as substantially lower battery replacement costs when finally required. 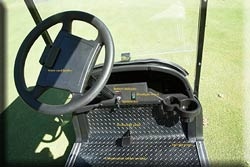 While the Golf-Mate is a little smaller than conventional carts it can match the performance of many. Another customer comment. "It drives like a sports car". 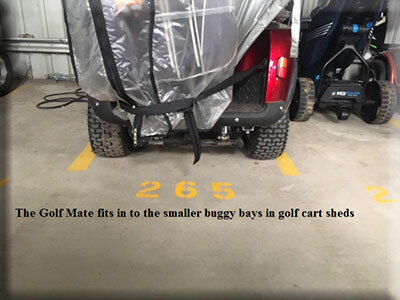 The size offers benefits of ease of transport as they will fit in to the typical 6 x 4 trailer, also the fact they take less floor space is an advantage when storing at the club or at home.​ There are substantial numbers of Golf-Mate carts in a major metropolitan club in Perth, A major factor in the customers choice is the fact that they will fit in to the narrower bays in the cart shed that are used for the smaller Gopher type ride on units. Obligation free demo's available in the greater Perth Area. Regenerative braking. Only 1 control pedal for power and braking makes driving a breeze for any age. usb port to keep your range finder of mobile phone charged. 36v headlights, indicator and tail lights. Tyres: 15 x 6.00 x 6. Dimensions: Length 1.8m. Width 0.9m. - Wheelbase: Axle to axle 1.3m. - Height: A) Without screen and canopy 1.26m B) With screen and canopy 1.84m. Can be transported in most 6 x 4 trailers. No special trailer needed. Lighter and more maneuverable than larger golf carts. We can custom fit accessories to suit your needs. A range of accessories such as tow bar, bin hook for towing multiple wheelie bins, work trays, work lights etc. can be fitted for use in many non golf applications as well as golf. This is an excellent unit for general mobility or use as a maintenance vehicle for the likes of Lifestyle villages, larger schools etc. due to the low operating noise level and zero emission combined with great maneuverability and general ease of use. Hard Top Canopy and drop down screen. The canopy has a solid frame fitted to ensure stability and endurance together with a 2 piece drop down screen. 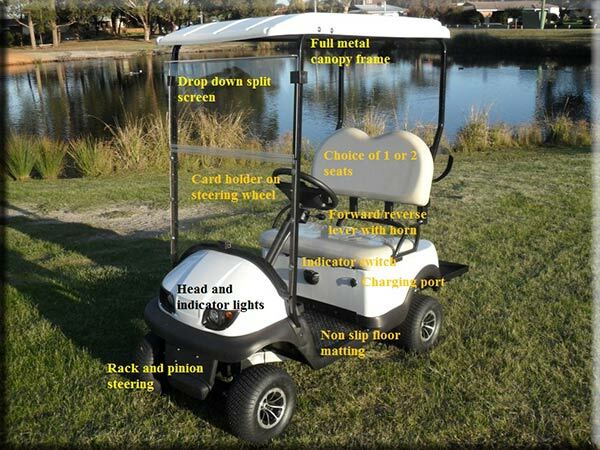 The MiCaddy GM2 golf cart is fully featured. The MiCaddy GM2 golf cart Takes less room than many carts and will fit into the smaller storage areas of most golf club storage facilities. 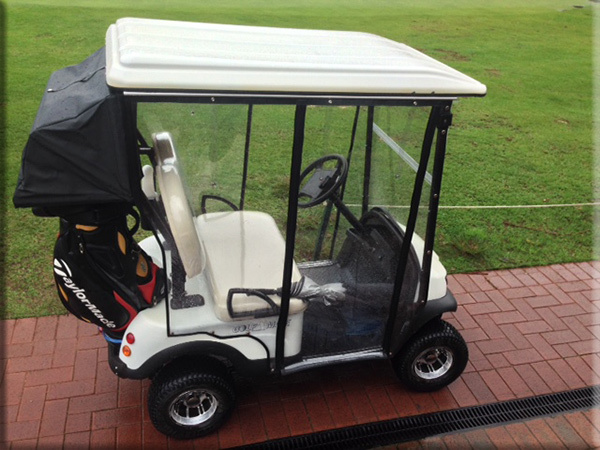 The MiCaddy GM2 golf cart shown here is fitting into the smaller storage bay. The MiCaddy GM2 Golf Mate has all the controls at your fingertips. 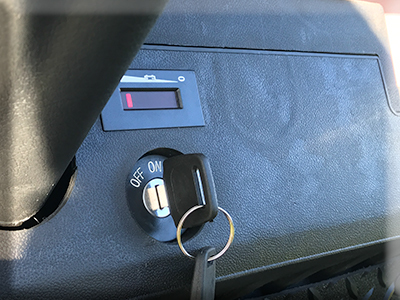 The key and battery meter are located on the front panel. Note the card holder on the steering wheel and the anti-slip floor matting fitted for long term use. Fingertip Direction, lights and horn control. 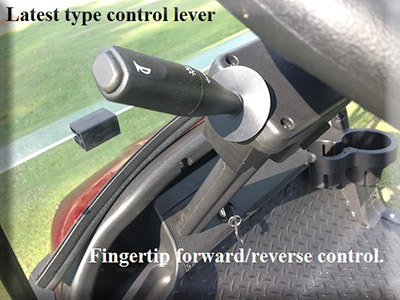 The MiCaddy GM2 has a forward / reverse lever mounted on the steering column for ease of changing from forward to reverse and back again. Very handy for parking in narrow buggy bays in the clubs cart shed. It is at your fingertips at all times and it also controls the headlights, indicators and the horn. When combined with the 1 pedal operation for speed and brake control it makes driving a breeze for any age. LED Head and Indicator Lights. 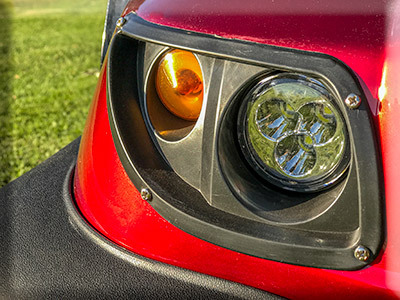 Just in case you are a little late getting in off the course, the MiCaddy Golf-Mate GM2 cart has LED headlights, taillights and indicators. You will be easily seen and won't run into anything unexpectedly when you are using it after dark. This is very handy when used for non golf applications such as in some commercial applications or use on hobby farms. Key and Battery Level guage. 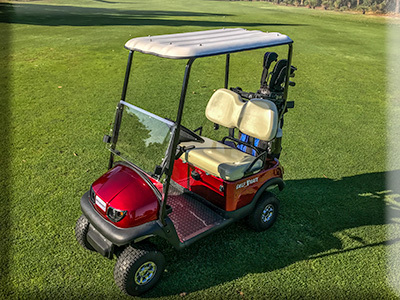 The MiCaddy GM2 Golf-Mate has a key to turn the power on and off and is fitted with a battery power level guage to show the charge level of the cart batteries at any given time. This provides the opportunity to ensure you shall have plenty of power to complete your round. The MiCaddy GM2 Golf-Mate is fitted with a quality oil filled (rather than grease) transaxle that is easy to service if ever the need should arise. 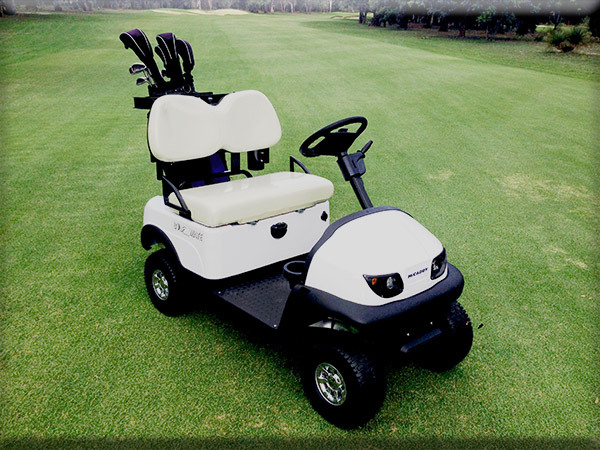 This cart is also fitted with a strong chassis and adjustable shock absorbers to give you a smooth comfortable ride. 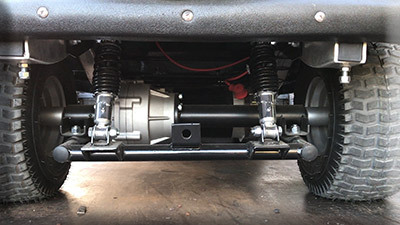 If the cart is needed to be moved without power there is a lever located on the transaxle that releases the parking brake to allow the cart to be pushed or towed as required. It is important that you refer to the specific instructions on towing in your user manual to prevent possible damage to the motor/transaxle.